59 Kent Street (ca. 1910: F. Nelson, architect). The Landmarks Preservation Commission has posted its designation report for the Eberhard Faber Historic District (warning: pdf link). As usual, LPC has done good and diligent work, nailing down dates and locating architects (although the report neglects to mention buildings such as this that were excluded from the district as the result of some prophylactic demolition. The Eberhard Faber designation, which the Landmarks Commission approved on 30 October, still has to be approved by the City Council. Curbed had a posting recently that may spell the beginning of the end of the Weidmann Cooperage building at North 11th and Wythe. The building, which was designed by architect Theobald Engelhardt and constructed in 1900, is notable for its concave reentrant corner. This is believed to have been the location of an iron barrel chute, used for unloading barrels from the cooperage, or a spiral fire stair. 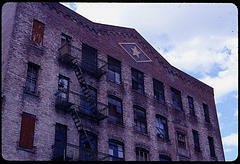 Paul Weidmann's first cooperage was located on the East River at North 3rd Street as early as 1881. It was a major supplier of barrels to local sugar refiners and other businesses. In 1884, Weidmann acquired the block along the East River between North 6th and North 7th to expand his operations. During this time, Weidmann's operated as the cooperage for the Sugar Trust, the trust controlled by the Havemeyer family. At some point around 1890, Weidmann sold out his interests in the cooperage to the Trust, which in turn formed the Brooklyn Cooperage Company under the leadership of Lowell M. Palmer (hence, Palmer's Dock). During the 1890s, Weidmann used the proceeds from the sale of his cooperage to start a brewery and speculate in real estate. The Weidmann Brewery was located on North 1st near Berry. Among Weidmann's real estate ventures was the purchase of the property immediately east of Steeplechase Park in Coney Island. In 1893, Weidmann and his sons Paul Jr. and Louis were back in the cooperage business with a new plant at North 11th and Wythe. 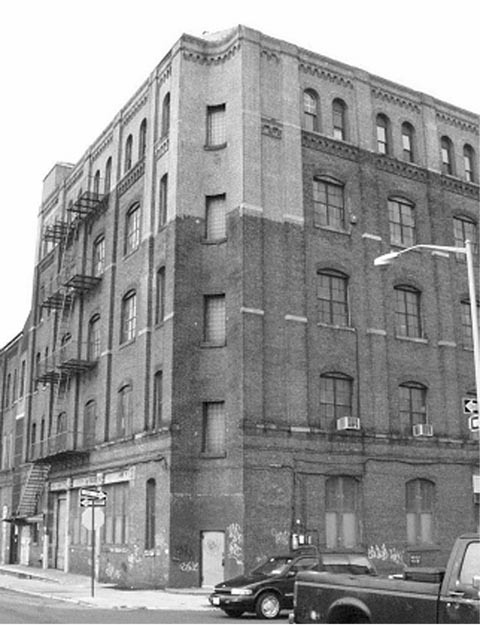 This new Weidmann's cooperage was established to serve the independent sugar producers, of which there were a number in north Brooklyn. At its peak production, the North 11th Street cooperage could produce between 6,000 and 7,000 barrels a day. The North 11th Street cooperage burned in June, 1900, killing at least 6 workers. Following the fire, the Weidmanns hired Engelhardt to design the current building, construction on which was begun in 1901. Theobald Englehardt was the most prolific and eclectic architect of the turn of the 20th Century. Among others, he was responsible for the design of the North Side Savings Bank at Grand and Kent and the former Old Dutch Mustard Company building at Metropolitan and Wythe, among others. The cooperage was nominated as a local Landmark by the Municipal Art Society in 2005, and WGPA has asked the Landmarks Commission to consider the building in light of these latest developments. According to Curbed and DOB, a hotel conversion is planned for the site. The project is being developed by Two Trees Management, the DUMBO development company of the Walentas family, and is designed by Marris Adjmi Partners architects. Adjmi has designed a number of new buildings in historic districts, and is known for his modernist yet contextual aesthetic. Based on the DOB filing, which describes a three to four-story rooftop expansion, Adjmi has his work cut out for him. In the 2005 Williamsburg rezoning, the Weidmann site was left in a small pocket of manufacturing centered on the Bushwick inlet. That pocket was intended to protect manufacturing uses in an area that a particularly high concentration of such uses. Hotel uses are allowed as-of-right in this manufacturing zone, a facet of the zoning code that has raised a variety of concerns in recent years. 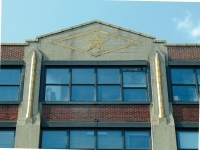 In addition to the Curbed posting, the Brooklyn Eagle has an article out today which adds little information (and gets the date of the building wrong).